On the hunt for Vancouver’s best street food? Soho Road is worth checking out. You’ll notice twelve new food carts popping up around Vancouver this month – and to say the scene has diversified (and improved) is an understatement. We’ve got El Salvadorian (Guanaco Truck), Thai (Rimfoodbaht) and exciting Indian options to look forward to from Soho Road. Sarb Mund, owner of the Soho Road brand, is soon launching two concepts: Soho Road Tiffin Truck – where he’ll serve meat and veggie dishes in reusable steel tiffin boxes, and Chawalla – a breakfast cart serving Indian teas and paranthas from 7am. 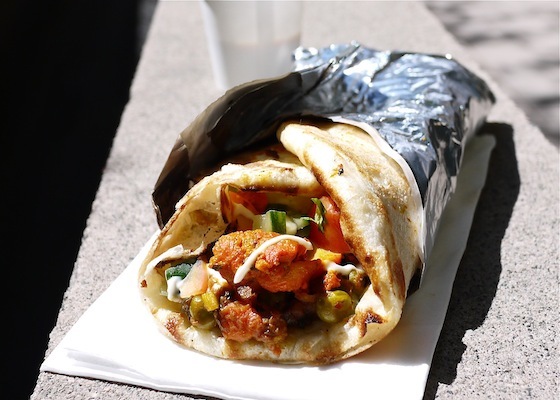 For now, head to the downtown law courts and listen for Bollywood music – here you’ll find smiling Sarb assembling kebabs as quickly as he can. The most authentic item, he told me, is the Vegetable Sabji. Deliciously fragrant stewed vegetables and tender chicken peaked out from the brilliant charred naan (which is cooked in the cart’s own tandoor). Sprinkled with fresh cucumber salad, every inch of my mouth tingled with intense flavor. Of all the street food out there, this is one of the must-tries.